Liu Xiaobo's wife Liu Xia is free and the Chinese government will protect her legitimate rights in accordance with the law, a Shenyang official said Saturday. Liu Xia is free, but she is in great sorrow over the death of her husband. Relevant authorities have respected her wish not to be disturbed, Zhang Qingyang, spokesperson of the information office of Shenyang government, said at a news briefing held in Shenyang, Northeast China's Liaoning Province on Saturday. "The Chinese government will protect Liu Xia’s legitimate rights as a Chinese citizen," Zhang said when asked at the briefing about whether Liu Xia is free to go abroad. Liu Xiaobo’s body was cremated following a farewell ceremony on Saturday morning in Shenyang. The ceremony was held at a funeral parlor in southern Shenyang’s Hunnan district. Liu Xiaobo’s family members, including Liu Xia and his brother Liu Xiaoguang, as well as Liu Xiaobo’s friends, attended the ceremony. The ceremony was arranged based on the wishes of his family and local custom, according to Zhang. Aside from one of Liu Xiaobo’s brothers, who could not attend for personal reasons, and Liu Xiaobo’s ex-wife and son, who are currently in the US, all of his relatives attended the funeral, Zhang said. 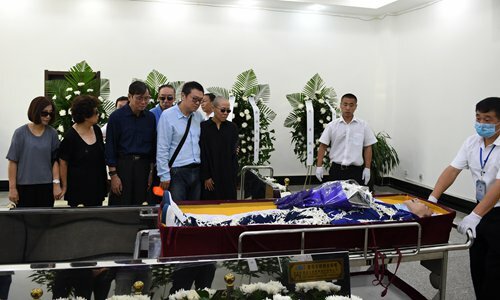 At 6:30 am Saturday, Liu Xia was the first to bid farewell to her husband to the strains of Mozart's Requiem, then Liu's relatives and friends bowed three times in front of his body during the ceremony. 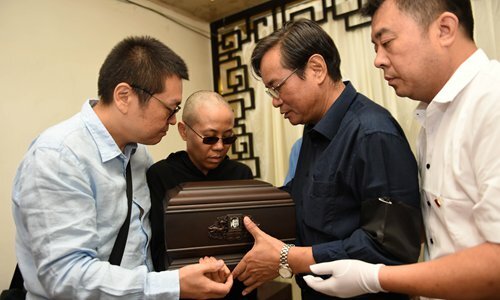 Liu Xiaobo's family members, including Liu Xia and Liu Xiaoguang, decided to cremate his remains and to hold a simple funeral after consultations. Liu Xiaobo, 61, died from liver cancer on Thursday, following severe multiple organ failure.